Michelle is an MSc student at The University of Edinburgh. She is an aspiring freelance writer who has lived in Edinburgh for the past 4 years, and is very familiar with the city. Visit her blog https://meanderingmichelle.wordpress.com/ for more. 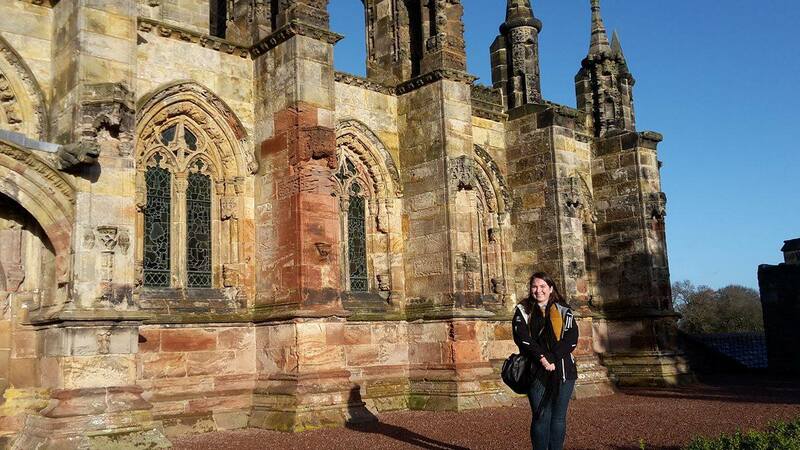 Last weekend I needed to escape the inner city, and I decided to take a trip to Rosslyn Chapel. Located on the outskirts of Edinburgh, this chapel was made famous in recent times by the movie The Da Vinci Code (2006). It is a place which has attracted various celebrity guests over time, and figures such as Robert Burns, William and Dorothy Wordsworth and Queen Victoria are among its more high-profile visitors. Oliver Cromwell also ransacked it and used it as a stable at one point. Rosslyn itself is a beautiful medieval chapel, and in addition to guided tours of the chapel, the new visitors centre has interactive screens where you can learn more about the intricate carvings and notable architectural features of the chapel itself. Small pods hang from the ceiling which play animations about various historical events which have taken place at the chapel. In particular, the Apprentice Pillar is a piece of architectural beauty, and the master carver is said to have killed his apprentice in a fit of jealous rage when he saw it. Imagery of pagan deities, stories of murder, ghosts and dream visions make Rosslyn a great place to visit and learn more about. Unfortunately no images are allowed inside the chapel, but the exterior is also beautiful. The visitor centre also has a coffee shop, which is stocked by local suppliers, and run by Saltire Hospitality. In the summer there is also an area for outdoor seating which overlooks the Roslin Glen. Since the 1980s, there have been speculations around the chapels connection to Freemasonry, the Holy Grail and the Knights Templar, which was made famous by Dan Brown's novel The Da Vinci Code (2003). Ask the people who work there though, and they will tell you that there is no proof that there is any connection between Rosslyn Chapel and the Knights Templar. There are no surviving documents from the origin of the chapel, which makes these theories both hard to dispel and to prove. As such, there are many different theories, stories and legends to explore in relation to the chapel. From the city centre the Lothian Bus service no. 37 (via Roslin) will take you to Roslin Village in just under an hour. Get off by the Original Rosslyn Hotel and a short walk will take you to the chapel. There is also free parking available for those who arrive by car.